Did you know that 7 in 10 caregivers report making accommodations at work because of their caregiving obligations at home? This means caregiving duties impact the ability to earn money. Not only is caregiving expensive, but there are costs that are not purely financial. This is why it’s crucial to figure out how many assets are available to help pay for caregiving help when help is required. The “financial tipping point” is the point at which help needs to be considered. The sooner you can begin the planning for caring for a loved one with dementia, the more ready you and your family will be for the progression of the disease. 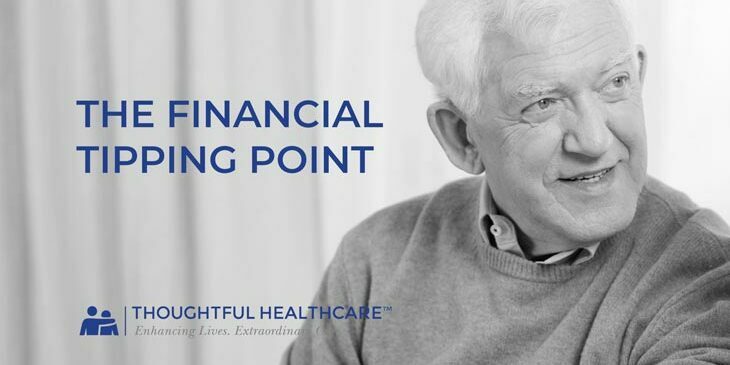 This video, hosted by Tim Tholen, CEO and Founder of Kansas City’s Thoughtful Healthcare and its affiliates, looks at the costs associated with caring for a loved one with dementia. Tim takes a practical look at what costs are associated with caregiving help, and when those assets will be needed. A little planning goes a long way. We at KC Homecare are here to help. Our professionally trained staff is a phone call away. Watch “The Financial Tipping Point” video below.